Tags: 2020VQ, Autumn, blind hiker, community, Education, Fundraising, guest blogger, Hiking, Inspiration, Kilimanjaro, Outreach, Peak Potential, Randy, success. Future Guide Dog Honey meets Autumn! The event was attended by 24 puppy raisers from NH, ME and MA and 6 puppies in training (3 black Labs and 3 yellow Labs). The hit of the party was 8-week-old yellow Lab “Honey” that was carried around and loved by all. This event is a special night for the puppy raisers. It is a chance to socialize with each other while supporting a cause that is at the core of each of us. This is to provide the gift of love and raise a puppy for approximately 14 months and then give it back to Guiding Eyes for the Blind. This priceless gift – a Guide Dog will provide a person with vision loss, not only independence and mobility but also companionship. The dinner works as a wonderful training venue for our pups. It allows the puppies to practice greeting people, settling at the tables with other dogs and practicing good house manners while food is being served. We each appreciate the chance to be welcomed with our pups by all of those attending the event. Pat Weber, the Regional Manager for Guiding Eyes for the Blind, and Bill LeBlanc, the NH Region Coordinator, accepted a check from 2020 Vision Quest of $20,200 for the non-profit Guiding Eyes for the Blind. 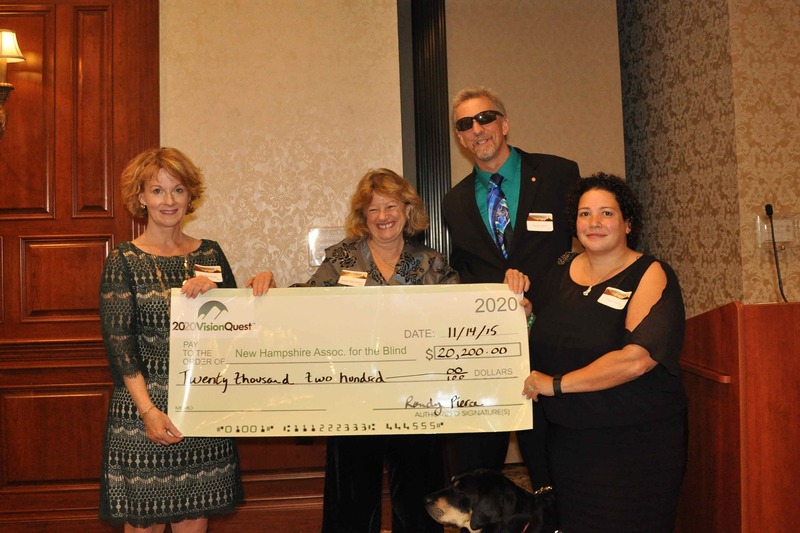 A second check for $20,200 was given to the NH Association of the Blind. 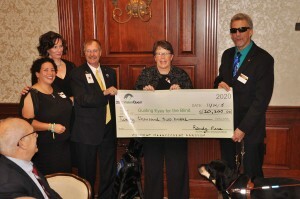 NH Association for the Blind receives a check from 2020 Vision Quest. The culmination of the dinner is getting the chance to hear Randy Pierce speak. The slideshow that accompanied Randy’s talk reviewed some of his amazing accomplishments as a blind athlete this past year: running the Boston Marathon and the National Championship, being the first blind athlete to compete in the Tough Mudder in LA, watching the amazing video and then Climbing Mount Kilimanjaro in Africa. Throughout the slideshow Randy mentioned his beloved Guide Dog Quinn who passed away from cancer a year and a half ago. His dedication and devotion to Quinn is evident as you hear Randy’s voice quiver at the mention of his unforgettable pup. All of the puppy raisers also learn by watching Randy’s Guide Dog Autumn working the event with Randy. 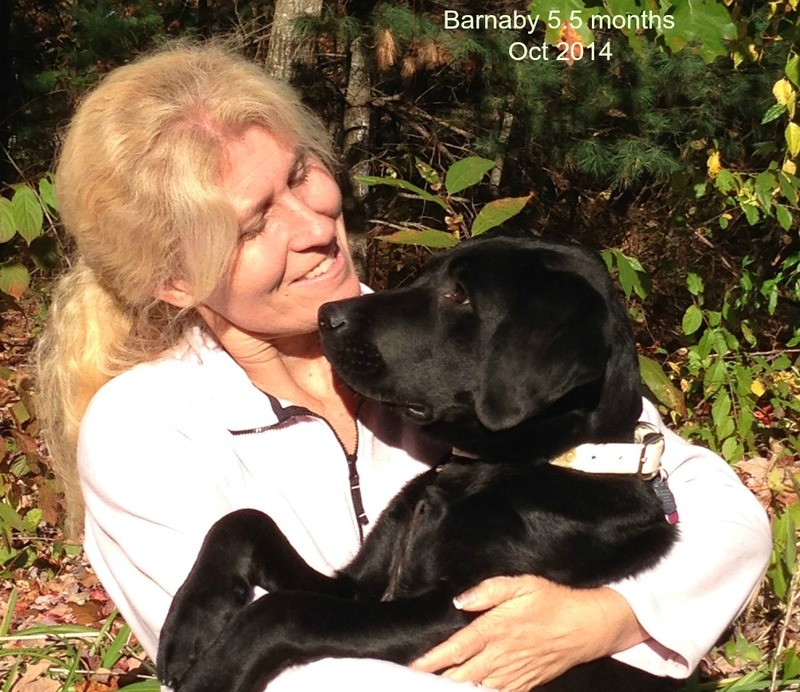 She is a beautiful black and tan Labrador retriever that Randy received from Guiding Eyes for the Blind. 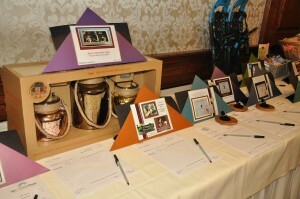 The array of silent auction items to raise money for our worthy causes. Randy has vision. He is a goal setter. We found out that in the next year, Randy plans on writing a book. 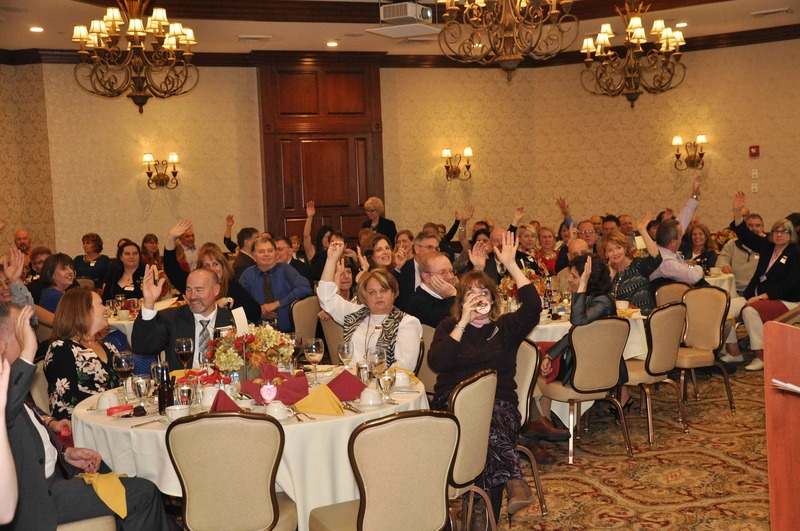 It was fun watching Randy act as an auctioneer – one of the special auction items was to be emailed pages of the book he will be writing each month. The silent auctions were fabulous. It was fun to take my pup “Gary” and walk by all of the incredible silent auction items. What a great way to raise money for the 2020 Vision Quest charity. 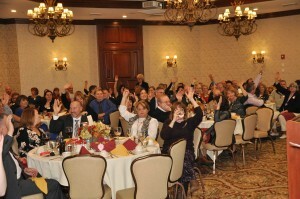 Lively participation in our live auction. One of the key missions of 2020 Vision Quest is to lead and inspire students and professionals to reach beyond adversity and achieve their “peak potential.” It is mind boggling to think that Randy and 2020 Vision Quest have spoken to 45,000 students. He recounted letters he has received from some of the schools. Just recently, a student that attended one of Randy’s presentations was going to drop out of school — but decided not to because of the inspiration and impacting message that he received from Randy. He does this all while integrating life lessons into little stories that teach about overcoming obstacles by managing adversity. By attending the Peak Potential Dinner and Charity Auction, I am able to support the organization that is so important to me – Guiding Eyes for the Blind – but I gain so much from Randy. He inspires me to do more…. To push myself….. To set Goals…. To have vision… in both my personal life and in my career. Thank you, Randy… you GIVE . 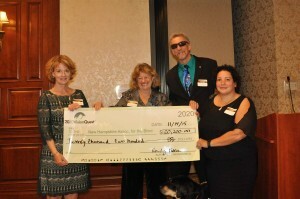 Michelle Russell, MBA, is a puppy raiser for Guiding Eyes for the Blind and a NH Region Volunteer. She has raised 3 pups, currently one of the pups she raised – Black Labrador Retriever “Randy” is in NYC working as a bomb detection dog keeping us safe. 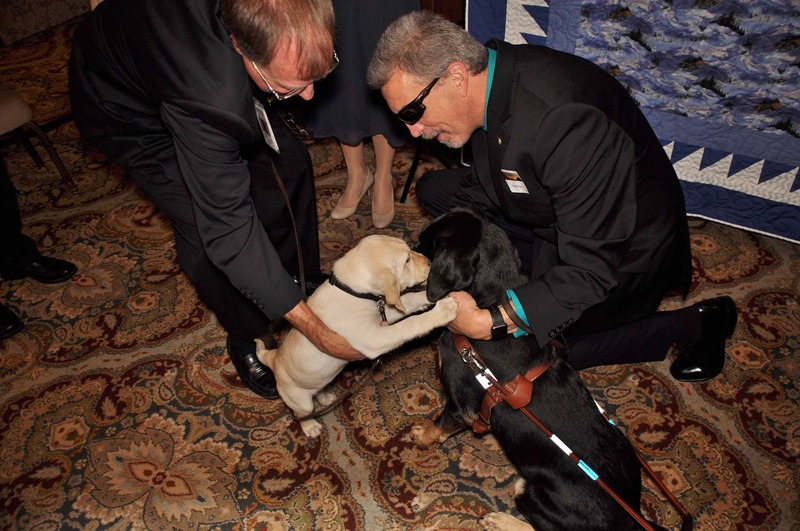 The puppy that she is currently raising (pup #4) is 5-month-old black Lab “Gary” who attended the dinner. She is also a Realtor with Keller Williams Realty in Nashua, NH. Please visit her website. If anyone is interested in becoming a puppy raiser for Guiding Eyes for the Blind or buying/selling a home in NH they can contact Michelle@NHselecthomes.com for more information.